Sneaking off a boat in the dead of night, the Turtles have joined Splinter on a pilgrimage back to his hometown in Japan. It is a small village buried deep in the mountains. Splinter wants to revisit the home of Hamato Yoshi, which he has not seen since they fled Japan from the Foot Clan many years ago. Not far away, two little girls, Naoko and Michi, have decided to explore an old haunted house hidden deep in the forest away from the main settlement. Supposedly, a beautiful woman once lived there. Two men were in love with her and when she rejected one of them, he tried to kill her. The one she truly loved came to her rescue and killed the evil man, and his spirit now haunts the home. Or so the ghost story goes. As they enter the rundown house, the door closes behind them all by itself. Elsewhere, the Turtles and Splinter succeed in finding the remains of Yoshi’s home, though all that remains are a few blocks of the stone foundation. 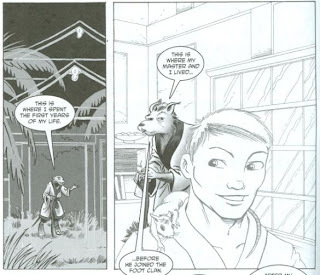 Splinter explains that as part of Foot Clan procedure, the entire family of any treasonous member is to be executed as punishment; thus, he surmises that the house was likely burned to the ground. 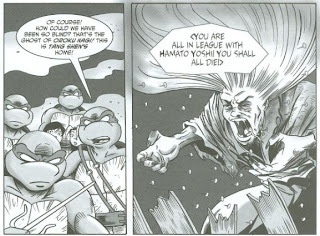 The Turtles ask if that means the entire Hamato Clan has been killed, but Splinter does not know and tells them not to worry, as nothing in the past can be changed. Back at the haunted house, an old lantern suddenly lights up (a sign of spiritual presence in Japanese myth). Michi and Naoko get scared and try to run away, but the door won’t open. Suddenly, a strange force approaches them and they scream. In the village there is a great commotion over the two lost girls. 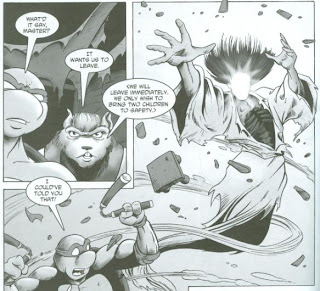 The Turtles and Splinter listen in and hear talk that they may have gone to visit a haunted house. The Turtles decide to help from the shadows and investigate the house while the villagers gather together. Inside the home, Splinter says he feels a familiar presence. They’re then approached by a strange glowing phantom, demanding they leave. 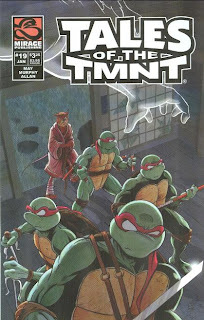 Donatello, a skeptic, refuses to believe that it’s an actual ghost, but with lack of evidence to the contrary, he decides to join his brothers and sensei in running away. They find Michi and Naoko, who are reluctant at first to trust the five weird monsters, but Mikey wins them over. The ghost refuses to let them leave, turning the floorboards into snakes. The ghost suddenly recognizes Splinter’s essence as that of Hamato Yoshi’s pet rat. Finally, it dawns on Splinter that this is the home of Tang Shen and they are dealing with the ghost of Oroku Nagi. Swearing vengeance against all members of the Hamato Clan, Nagi sends a tornado of razor-sharp debris at the Turtles. Dodging, Splinter deduces that cleansing the home in fire is the only means of exorcising the restless spirit and, producing a book of matches from his pocket, lights up the old house. The Turtles and Splinter escape with the two girls just as the entire house goes up in flames and the spirit of Nagi dissipates. Michi and Naoko thank the Turtles for their help and run off back to their village. As Don concedes that ghosts do exist, Leo asks if Nagi has moved on. Splinter says that he cannot sense Nagi’s presence any longer and that now that the land has been cleansed, it may someday be peaceful again. As they disappear into the forest, the specters of Hamato Yoshi and Tang Shen rise from the flames, embracing one another. *Oroku Nagi's attack on Tang Shen and subsequent death at the hands of Hamato Yoshi was seen in TMNT (Vol. 1) #1. *The Foot Clan’s procedure of killing the entire family of a member for treason will be explored in greater depth in Tales of the TMNT (Vol. 2) #65. *The town the Turtles visit is unnamed. In TMNT (Vol. 2) #1, Splinter says that his hometown is a village called Chihaya, so that is likely where this story takes place. Ah, Oroku Nagi; the most superfluous part of the Ninja Turtles’ origin. I mean, I can see why most adaptations (such as the movies and the current IDW comic) cut him out; it makes for just as strong a revenge theme to have Oroku Saki be the one to menace Tang Shen from the get-go than to create an older brother character to menace her, then have Yoshi kill him, then have Saki swear vengeance, then have Saki kill them both. If anything, the only aspect I like about Nagi’s existence in the Mirage series is that it gave Saki a more “noble” reason for revenge against Yoshi; instead of wanting to kill him for stealing his woman, he wanted to kill him for murdering his brother. 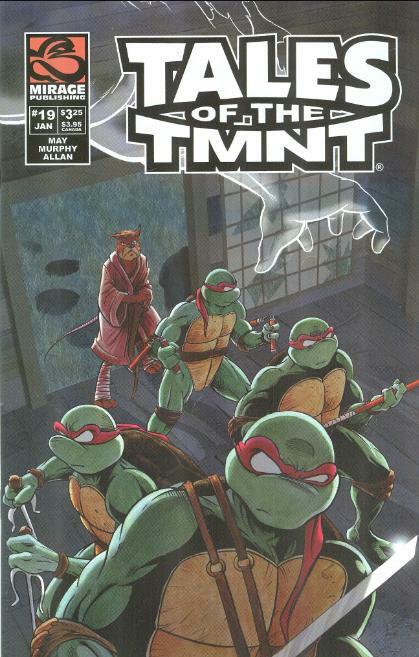 TMNT #1 also included narrative text about the Foot Clan warping and manipulating Saki from a young age, robbing him of his innocence to fuel his hatred, but they never explored that concept to any extent and kind of squandered a chance at some tragic depth for the Shredder. That tangent aside, it was still nice of author Ross May to explore Nagi’s spiritual fate, wrapping things up in a neat little ghost story. While Nagi doesn’t get much character exploration and remains the prop he’s always been, he functions as a pretty good one-shot villain for the story. From a standard haunted house POV, Nagi certainly has reason-enough to be a restless spirit and having him become so adds a nice layer to the overall Mirage TMNT mythology. What got me was that Splinter seemed to hold no grudge against Nagi whatsoever and more or less wished him well after exorcising his spirit. This is a major contrast from the Splinter seen in TMNT #1, who was all about the vengeance against those who wronged his Master Yoshi. It’s clear to see how much Splinter has mellowed since his introduction, and I prefer the wise and humble old sage over the revenge-thirsty master assassin. It’s interesting to see how Chris Allan's style has developed in the decade and some change since he last drew the TMNT Adventures. While he’s slightly altered his style to better match the Mirage universe, he’s lost none of his aptitude for layouts, poses and just the insane ability to translate the sensation of movement to the static page. His design for Phantom Nagi is really cool, even if the long hair and glowing face reminds me a bit too much of the box cover for “The Thing”. The little girls are cute, too; especially the one that looks like Juniper Lee (HA! Remember that cartoon?). While Allan’s personal schedule kept him from doing too many issues of Tales of the TMNT, and not all the ones he did had scripts this good, his talent is always something to be savored and appreciated. All in all, I commend Ross May for taking a rather forgettable element of the TMNT’s origin and wringing some story potential out of it. While Nagi doesn’t receive any superior characterization it was still fun to see him make a revenge bid from beyond the grave. Kinda weird to see Allen's Turtles without pupils (occasionally). The eyes seem too big without them. Some of the adaptations? Oroku Nagi at this point is still a character exclusive to the Mirage Comics, and I believe this issue was his first appearance since 1984. I've always liked him as his rivalry with Yoshi just presents and endless cycle of revenge that ends between the Turtles and Saki.